Dean Wareham of Luna, 2007. No.6, Beggars Banquet, Elektra, Jericho, Jetset, Arena Rock Recording Co. The earliest edition of the band also included drummer Stanley Demeski and bassist Justin Harwood (Demeski formerly of The Feelies and Harwood formerly of New Zealand band The Chills). The original line-up was expanded with the addition of guitarist Sean Eden for their second album, 1994's Bewitched. Lee Wall replaced Demeski on drums in time for 1997's Pup Tent, and Britta Phillips of Ultra Baby Fat and The Belltower (also known as the singing voice of animated character Jem) joined when bassist Justin Harwood departed in 2000. Phillips and Wareham became romantically involved and eventually married in 2007. In 1991, after the end of Galaxie 500's US tour supporting the Cocteau Twins, Dean Wareham told his bandmates Damon Krukowski and Naomi Yang that he was quitting the band. Wareham then signed a demo deal with Elektra Records and recorded a number of tracks with Mercury Rev drummer Jimmy Chambers. Some of these recordings were later released on the "Anesthesia" single on No.6 Records in the US and Mint Tea in the UK under the name "Dean Wareham." Shortly after the release of Lunapark, the band placed an advertisement in the Village Voice for a guitarist, and Canadian former drama student Sean Eden was recruited. The new four-piece recorded a number of cover versions that would become the Slide EP, and then toured the US. In mid-1993 the band supported the reformed Velvet Underground on their European tour, after which they recorded their second album. Bewitched was recorded in New York City and co-produced by the band with Victor Van Vugt. Velvet Underground guitarist Sterling Morrison played guitar on two tracks. The album was released in 1994. In 1995 the band went into Sorcerer Sound studio in New York City with producer Pat McCarthy and engineer Mario Salvati to record their third album Penthouse. 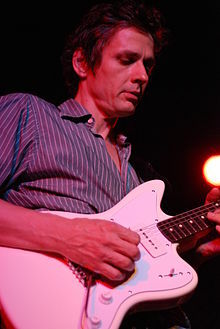 The album featured Television guitarist Tom Verlaine on the tracks "Moon Palace" and "23 Minutes in Brussels." The album was released in August 1995 to critical acclaim, with Rolling Stone declaring it one of the essential albums of the 90s. The album featured a cover of Serge Gainsbourg's "Bonnie and Clyde" as a hidden track, the song featured Lætitia Sadier of Stereolab duetting with Dean Wareham. "Bonnie and Clyde" was released as a single in the UK and was named Melody Maker single of the week. Pup Tent followed in 1997. In 1999 the band recorded The Days of Our Nights for Elektra, but the label declined the album as "not commercially viable" and dropped the band. The record was ultimately released on Jericho Records in the US. Prior to the album's release, Justin Harwood left the band, and was replaced by Britta Phillips. Phillips and Wareham began a romantic affair, leading to Wareham's divorce; the new couple eventually married. After releasing Luna Live (2001), Romantica (2002) and Rendezvous (2004) with their new line-up, Luna announced their final tour (at the time), disbanding after a show at the Bowery Ballroom on February 27, 2005. Dean Wareham and Britta Phillips continued on as the duo Dean & Britta, initially formed in 2003. In 2012, Sean Eden joined a Dean & Britta performance at the Shine A Light Festival in Brooklyn, performing a short set of Luna tunes in a one-off reunion performance. In 2014, Dean Wareham announced via Twitter that Luna would reunite for a tour of Spain in 2015, to be followed by US dates. In 2017, Luna announced two new releases, a Luna covers LP, A Sentimental Education, and a 6-song original instrumental EP, A Place Of Greater Safety, with a tour of Spain in October and a North American tour in November 2017. This page was last edited on 14 March 2019, at 06:53 (UTC).